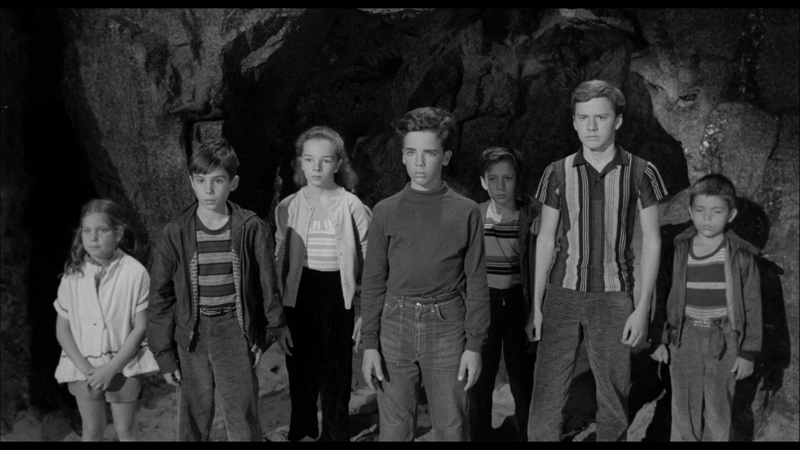 The Space Children (Olive) is one of the most intriguing science fiction films of the cold war, part alien invasion thriller and part anti-nuclear message movie, with the children of Earth essentially conscripted by a throbbing disembodied brain from outer space to sabotage a nuclear test. Director Jack Arnold and William Alland collaborated on some of the best science fiction films and most distinctive atomic monster movies of the 1950s, among them It Came From Outer Space, Creature From the Black Lagoon, and Tarantula, all made for Universal. The Space Children was made for Paramount, who gave them more freedom but less money. It shows. Arnold is saddled with a script that is both ambitious and confused, a cast that is credible at best, and a tight budget that doesn’t even allow him to match his terrific location shooting (he uses the beaches and rocks of the California coast as well as he does the southwest desert of Tarantula) with the studio-built cave where the kids find the glowing brain creature. For the missile pad itself, the target of the third-act plot, the production forgoes miniatures or trick shots and simply relies on a single matte painting. Given all that, Arnold creates a cold war movie where the fear of nuclear war is, for many of the civilians of the base, greater than the fear of the enemy. The film is set on a high security missile base on the California coast, where civilian experts have been brought together to work on a top secret project: a missile mounted on an orbiting satellite targeted on the enemy for instant attack. The community of scientists and their families living out of trailer homes on the missile base beach as a microcosm for American society. It’s part campground camaraderie and part working-class deprivation, with entire families crammed into tiny trailers and forced to step out to the communal picnic space for a little elbow room. The mix of the otherworldly and the prosaic, the fantastic and the banal, is both a limitation and a curious asset to the film’s eerie atmosphere. It’s B-movie political statement in flat dialogue and fantastical images, a combination that is easy to dismiss, but the ambivalence of the confused script in some ways make it more interesting than a more polished production might offer. It certainly makes it stand out from the rest of the drive-in sci-fi programmers of the era. For all its limitations, it is certainly the statement of a committed filmmaker. Olive presents the film on Blu-ray and DVD as part of its partnership with Paramount, in a widescreen edition rounded out to 16×9 widescreen. The framing looks fine as does the print and the mastering job, which is clean enough and free from damage with only minor scratches and speckling. No supplements.